The black gibbon is a small arboreal ape weighing about 8 kg (18 lb). It prefers subtropical and montane evergreen forests and eats mainly leaf buds, shoots, and fruits. Gibbons are mainly diurnal. A single young is usually born to a mature female black gibbon every 2 - 3 years. The black gibbon is the only polygynous gibbon species. Other gibbons are monogamous. The average size of black gibbon troops is about half a dozen individuals, which includes one adult male, one or more adult females and several young gibbons of various ages. The black gibbon was once widespread in forests throughout southern China and Vietnam and into Laos and Cambodia. In 1990 the only area where black gibbon populations were reported to be healthy was in Yunnan Province, China, with other populations in Laos and Vietnam having uncertain status (Bleisch & Nan 1990). In 2000 it was believed to occur in China, Laos and Vietnam (IUCN 2000) . 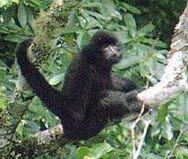 The black gibbon is threatened by loss of its preferred primary forest habitat, as well as by hunting for food and Oriental medicine. Extensive military activities within its range probably also had a detrimental effect. *** Chinese hunters consider gibbon meat to be delicious, and rural Chinese believe that gibbon bones provide an effective treatment for rheumatism. 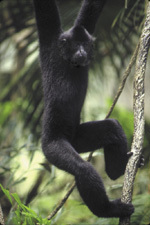 The black gibbon prefers subtropical and montane evergreen forests. A single young is usually born. The time between birth is usually 2 - 3 years. The black gibbon eats mainly leaf buds, shoots, and fruits, but rarely animals (Burnie & Wilson 2001) . All gibbons are strictly arboreal and mainly diurnal. The black gibbon lives in groups - usually a female, a male and their young (Burnie & Wilson 2001) . It is the only polygynous gibbon species. All others are monogamous (Haimoff et al. 1987) . Based on the amount of area covered by each habitat type, an overall density was then estimated of 0.20 - 0.66 groups/sq km (0.5 - 1.7 groups/sq mi) (350 - 1100 groups in 1670 sq km (640 sq mi) of natural protected areas in China). Using their estimate of 5 individuals/group gives an overall density of 1 - 3.3 individuals/sq km (2.6 - 8.6 individuals/sq mi).